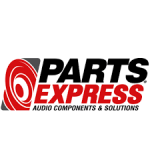 Selling high-quality audio parts and components since 1986, the professionals at Parts Express understand how to get the most out of home audio equipment, home theater solutions, vehicle audio setups, speaker kits, and live entertainment systems that they make available from their online shop. Customers can browse a product catalog that includes tens of thousands of components, with options available for those just getting started in the world of audio equipment as well as professionals and touring musicians that need the highest quality options available. Every Parts Express order of at least $100 includes free shipping, with all other orders shipping for just $6.95 throughout the United States.